I have A LOT of statement necklaces and scarves and was finding it difficult to locate and choose the pieces I was looking for when getting dressed for the day or for an evening out. The necklaces were in a pile on my dresser and would sometimes get tangled with one another. I decided to use the space on the inside of my closet door more efficiently by adding some wood and cup hooks! 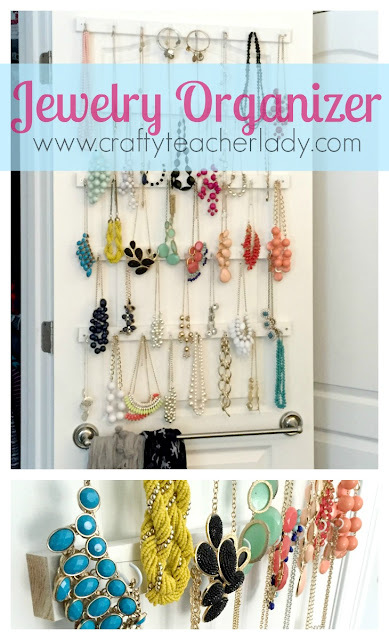 Today I'm sharing an easy and inexpensive way to turn any unused door space into a jewelry and accessory organizer for under $25! -5 pieces of primed 1.5"x3/4" pine board (really any inexpensive wood will do and the size is a matter of personal preference). I had my boards cut at Home Depot into 24" lengths. If I wanted to be fancy, I could have painted the boards but the primer was good enough for me! Using your screw gun and appropriate size drill bit, drill a hole about in inch in on each end of your pieces of wood. This will be where you will screw the wood into the back of your door. The holes should be large enough for your screws to fit through, without the screw head going through the hole. Screw the cup hooks into each piece of wood. I laid out all 5 pieces of wood so I could use a pencil to mark where I wanted each hook. 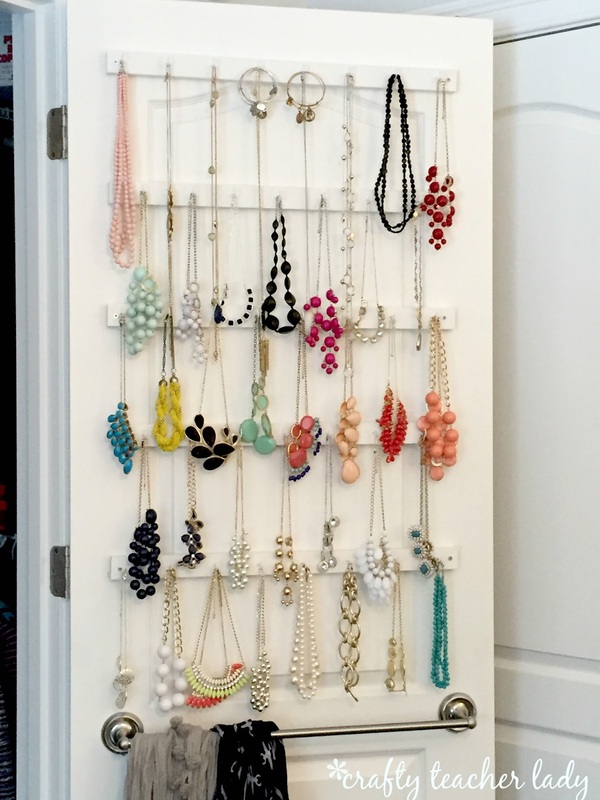 I staggered the hooks so that when the jewelry hangs, there is space for each necklace without falling on top of each other. It may be necessary to drill small starter holes into the wood to make it easier to screw in each hook by hand. I also had a pair of pliers ready to help with any stubborn twisting! I used 7-8 hooks on each piece of wood. Decide where you want your pieces of wood to be placed on your door. I used 5 pieces of wood on the top portion of my door as I also hung a towel rod on the lower portion for scarves. I marked where I wanted my top piece of wood to go as well as where I wanted to bottom piece to go, then divided the space in between evenly and marked where my remaining three pieces would go. Use your level and a pencil to mark where to drill your pilot holes. Then use your long screws to drill each piece of wood into your door. Be sure to stagger your pieces in correspondence with your hooks and make sure the screws you are using are not too long...you don't want them to drill straight through to the other side of your door! I left some space between the last piece of wood and the towel bar so that my necklaces have room to hang without being hidden. The towel bar was purchased for $10 at WalMart and is a great space to hang scarves and belts. Some hooks could even be added to hang purses, too! In total, the project cost less than $25, including the towel bar, which makes it really economical as well as practical! 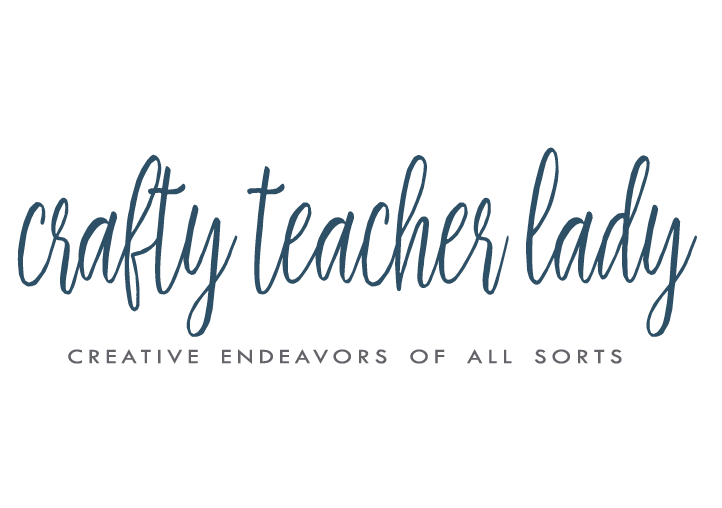 For more daily glimpses into the projects I'm working on, come find me on Instagram! Great idea, looks so clean and fresh.